featuring: Multi-track Programming on Science Fiction & Fantasy Literature, Art, Science, Media, Gaming, Costuming, & more. Autograph Party, Masquerade, Stardance, Writers' & Artists' Workshops, Author Readings, Book Dealers, Art Show & Auction, Childrens' Programs, Films, 3-Channel 24-Hour-A-Day Video, Hospitality & Fan Rooms. 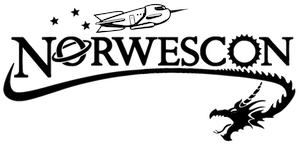 “Norwescon 12 Flyer,” Norwescon History, accessed April 19, 2019, http://history.norwescon.org/items/show/174.